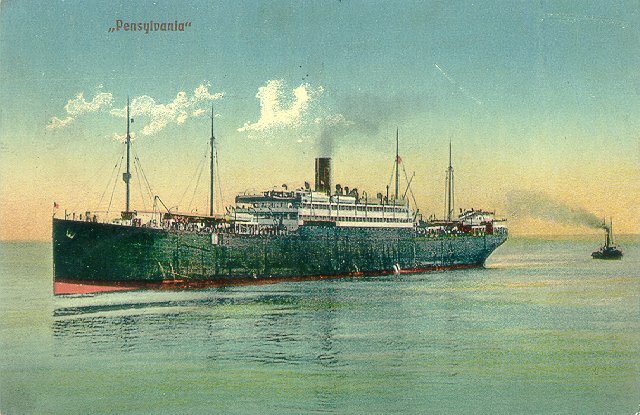 Pennsylvania was built for Hamburg-America (Hapag) by Harland & Wolff of Belfast. Launched in 1896, she made her maiden voyage from Belfast to New York on 30 January 1897 and then entered Hapag's Hamburg to New York service. She had an enormous steerage capacity of 2,382, as compared to a total of 340 in first and second classes combined. Pennsylvania's aftmost deckhouse was briefly fitted with a flight deck in 1910, with a view toward airplane takeoffs up to 50 miles (80 km) offshore, but it was removed after several Navy test flights. 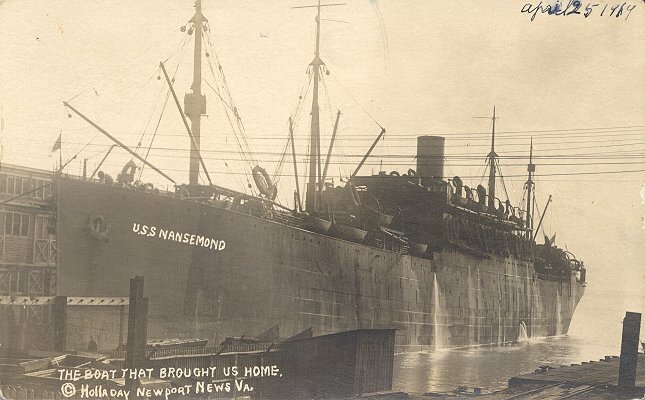 Interned at Hoboken, New Jersey, when World War I began in 1914, Pennsylvania was seized by the United States in April 1917 and renamed Nansemond. She was operated by the United States Shipping Board as a naval transport until 1919, when she was laid up in the Hudson River. Nansemond was scrapped in 1924. Sources: Bonsor's North Atlantic Seaway; Haws' Merchant Fleets in Profile; Kludas' Great Passenger Ships of the World.